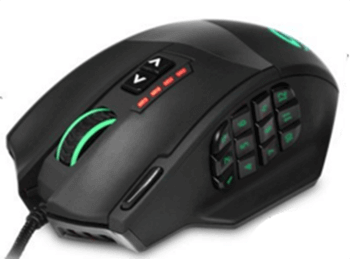 It’s not every day that you stumble upon a fully customizable gaming mouse with 19 buttons that costs less than $50. The UtechSmart Venus gaming laptop mouse is, without any doubt, a very attractive package for all lovers of strategic and MOBA games. Let’s take a look and see if it’s really possible to make a high-performance laser mouse on a budget. We’ll start our review by taking a closer look at the exterior of this mouse. The exterior is divided into many separate areas, which are designed to provide with superior comfort and grip. We can definitely say that this isn’t an uncomfortable mouse to use. However, there is something left to be desired in terms of its ergonomics. The side buttons are positioned in such a way that their frequent use can cause a fatigue and even finger strain. This can be minimized by mapping the most used functions to the most forward row of buttons, but that’s really just a workaround. The plastic materials feel slightly cheaper than what you find on more expensive mice, but it’s hard to complain when you consider that this mouse costs less than a half of what you would pay for a similar model from a renowned manufacturer. 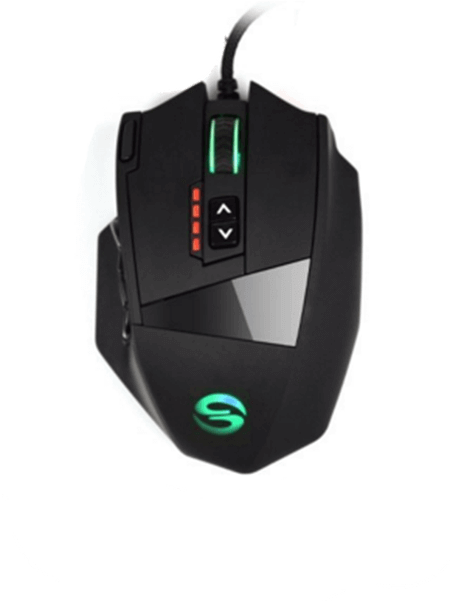 With all negative points out of the way, we can take a look at what actually makes this mouse worth recommending. First of all, the UtechSmart Venus gaming mouse features a high-end Avago sensor capable of 16400 DPI and 12000 FPS. The mouse has no problem dealing with an acceleration of up to 30G and 150 in/s cursor speed. We can promise you that you will never feel limited by its performance. The action is smooth and accurate under all conditions, and those 12 side buttons will quickly become absolutely indispensable for playing demanding strategic games. If the default configuration doesn’t suit your taste, you can use the included software and 8 tuning weights to adjust everything in precise increments. Each weight has 2.4g, which means that you can fine-tune how the mouse feels with an utmost precision. That applies even for the built-in RGB lighting. After you have set everything up, you can easily store up to 5 different settings profiles, and switch them using a dedicated button. As you can see, there’s a lot to like about the UtechSmart Venus 16400 laser mouse. And if that still isn’t enough, UtechSmart has also decided to include an 18-month warranty. If the style of this mouse suits your taste, go ahead. There’s no way you will end up being disappointed with your purchase.